Everyone speaks language. If people do not have a speech impediment, they acquire their native languages without any difficulties, regardless of his or her parents’ mother tongue. This fact implies that human beings have certain inborn and general abilities of acquiring any languages. The long-standing question was how we explain the process. Noam Chomsky, a MIT linguist, came up with the concept of how our language processing works. 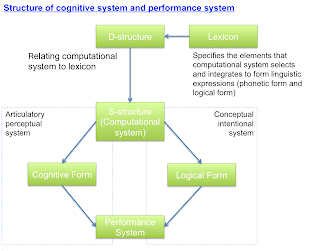 Chomsky argues that language faculty is composed of cognitive system and performance system. Cognitive system stores information, and performance system accesses to information and uses it. Performance system and cognitive system interact through two interfaces: the two systems interact each other by using phonetic form (utterance) of language through “articulatory perceptual system”, and using logical form (meaning) through “conceptual intentional system”. According to Chomsky, performance system does not vary in the manner of the cognitive system, i.e. the system is universal and does not change by the selection of languages. Thus, his study mainly focuses on the cognitive system. In Chomsky’s terminology, acquiring a language is equivalent to acquiring “generative grammar”. When one acquire languages, one is able to conduct infinitive use of finite means, i.e. once we acquire languages, the generative grammar allows us to “generate” any sentences regardless of our experiences and thus to rule out the ungrammatical language expressions. According to Chomsky, there is universal grammar (UG) by which we acquire any languages. UG is something common to all human speeches and an invariant system of human speech principles. The UG hypothesis explains why all human beings can acquire their native languages regardless of their parents’ mother tongue. The concept of relationship between UG and language acquisition has evolved as Chomsky develops his theory, and by the end of 20th century, he proposed the idea of “the Minimalist Program”. In the minimalist program, he argues that derivation (computation) and representation of languages are subject to a certain form of “least effort (minimalist approach)” condition and are required to be minimal in a fair well-defined sense. That is, the computation and representation process of human speech generally takes most efficient way, ruling out redundancy in language processing. Chomsky calls it “the most economical convergent derivation (page 201)”. According to the minimalist program approach, lexicon of cognitive system specifies the information that is optimal and non-redundant. This was the first time for me to read an orthodox linguistics book, and this book is so far the most challenging book among what I have read since this year (actually, this book could be more readable one). As always, it is the greatest pleasure to tackle a new concept and understand it, thus acquiring the new perspective to see the world. (I hope I understand his theory correctly in general sense…) By introducing the concept of UG, P&P model and the minimalist program, Chomsky made it far clear to understand the variety of human languages. I also would like to quote what Chomsky noted in question shaping. The remark is full of insights.